Pancon President and CEO Layton Croft stated: "The St. Laurent Project strengthens Pancon's strategy of exploring for essential battery and energy metals in low-risk jurisdictions near operating and former mines. It also brings a 5th project to Pancon's exploration portfolio in Northern Ontario, where we value our positive social license to operate. Past shallow drilling at our St. Laurent Project identified disseminated multi-element sulphide mineralization across notable widths trending towards a large gabbro-hosted magnetic feature. The Ni-Cu-Co-Au-Pt-Pd zone is open along strike and at depth. This mineralized zone, importantly, is coincident with a strong 600-metre long EM anomaly. Drilling to date has not yet intersected massive sulphides, and the EM anomaly has not yet been explained. The disseminated sulphide halo provides an important vector to guide our upcoming exploration work." Concurrent with this acquisition, the Company has made the decision to terminate its Option Agreement on the McBride Project in southeastern Ontario. From 2004-2007, Eastmain Resources and Xstrata completed a series of airborne geophysical MegaTEM surveys. Using 200-metre line spacing, the surveys revealed a prominent 600-metre long EM anomaly, coincident with the 1966 diamond drilling. The EM anomaly is strong and plunging to the northeast, below detection limits of the survey, and terminates abruptly to the southwest. St. Laurent's gabbro-hosted geological setting and exploration characteristics provide an analogue to the former gabbro-hosted Montcalm Ni-Cu-Co Mine adjacent to Pancon's other Northern Ontario projects. For comparison, the EM anomaly associated with the former Montcalm Mine was approximately 200-metres long, and the actual Montcalm deposit was approximately 350-metres long. Ni-Cu-Co sulphide deposits may consist of massive, semi-massive and net-textured lenses with disseminated halos. Such halos can provide good exploration vectors to target massive sulphides. The Project's strong airborne EM anomaly is a conductive feature that is positioned coincident with the non-conductive disseminated mineralization. The sulphur content from the assayed Eastmain mineralized zones are relatively low, which is expected with disseminated sulphides. Projected to massive sulphides of approximately 35% S, St. Laurent's Ni grade could potentially be 4.8% and the Co grade could potentially be 0.2%, which are comparable massive sulphide grades found at the former Montcalm Mine. Calculating Ni and Co tenor to 100% sulphide is a common practice in Ni-Cu-Co exploration to determine potential economic possibilities of nickel sulphide mineralization. Eastmain's 2008 exploration report states: "drilling has indicated that the mineralization is open in all directions, and therefore a more aggressive drill program should be undertaken on the claim block." The Project's mineralized zones have an associated geochemical anomaly, providing a cost-effective exploration tool in addition to drilling. 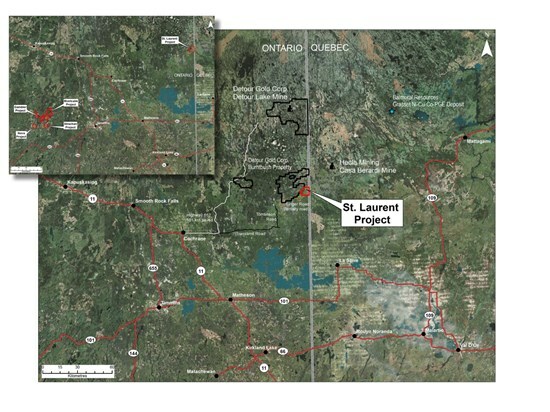 On March 25, 2019, Pancon entered into an Option Agreement (the "Agreement") with 2681891 Ontario Inc. to earn a 100% interest in the St. Laurent Project, which consists of 191 single cell claims and 18 boundary cell claims within St. Laurent Township in the Larder Lake Mining Division (see map below). Under the Agreement, to earn 100% interest, Pancon will pay a total of $145,000 cash and issue a total of 1,850,000 common shares over three years, as follows: (i) $15,000 cash and 250,000 common shares upon signing; (ii) $20,000 cash and 350,000 common shares at the first anniversary; (iii) $50,000 cash and 500,000 common shares at the second anniversary; and (iv) $60,000 cash and 750,000 common shares at the third anniversary. In addition, 2681891 Ontario Inc. retains a 2.5% net smelter royalty (NSR) on the Project, of which Pancon has the right to purchase 1% NSR for $1,000,000.